The N7142 is a simple, cost-effective, all-in-one presentation device with integrated networked AV ports. Easily pull content from the network and local sources, then deliver to two independent outputs, each mirrored. Local content can also be sent back onto the network making the N7142 perfect for distribution in an active learning environment, overflow classrooms and conference rooms; while the mirrored outputs on the N7142 make it ideal for integration with lecture capture systems and confidence monitors. 4K60 4:4:4 with support for HDMI 2.0 and HDCP 2.2 means never compromising video quality and delivering engaging content that retains the color depth and brilliance intended. The N7142 has extensive audio support with built-in DSP and 60W stereo amplifier capable of operating in 4Ω/8Ω, 70V, or 100V modes. 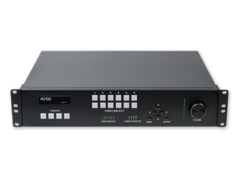 This, plus audio support for the HDMI inputs, as well as independent balanced stereo and microphone with phantom power, simplifies the purchasing decisions by providing a single, repeatable, device solution for multiple room sizes throughout a campus.